Every day, each individual wakes up with an idea of how he or she wants to celebrate life. It is our mission to work hard every day to find out what "Celebrating Life Every Day!" means to every one of our residents and their families, then help them achieve these goals. 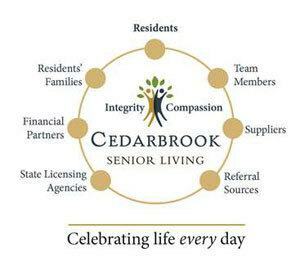 We will be the preeminent senior housing provider. The individuals in our logo represent our core values of Integrity and Compassion. The large leaf in the middle represents our residents, and our support of their dreams via our company's core values of Integrity and Compassion.